I read a story yesterday in Science Magazine that really stuck with me. It’s about a man who was diagnosed with leukemia and received a life-saving stem cell transplant that is now threatening his health. The man is name Lukas Wartman and is a doctor at Washington University School of Medicine in St. Louis. He was first diagnosed with a type of blood cancer called acute lymphoblastic leukemia (ALL) in 2003. Since then he has taken over 70 drugs and undergone two rounds of bone marrow stem cell transplants to fight off his cancer. The first stem cell transplant was from his brother, which replaced Wartman’s diseased bone marrow, containing blood forming stem cells and immune cells, with healthy cells. In combination with immunosuppressive drugs, the transplant worked without any complications. Unfortunately, a few years later the cancer returned. This time, Wartman opted for a second transplant from an unrelated donor. While the second transplant and cancer-fighting drugs have succeeded in keeping his cancer at bay, Wartman is now suffering from something equally life threatening – a condition called graft vs host disease (GVHD). In a nut shell, the stem cell transplant that cured him of cancer and saved his life is now attacking his body. GVHD is a disease where donor transplanted immune cells, called T cells, expand and attack the cells and tissues in your body because they see them as foreign invaders. GVHD occurs in approximately 50% of patients who receive bone marrow, peripheral blood or cord blood stem cell transplants, and typically affects the skin, eyes, mouth, liver and intestines. The main reason why GVHD is common following blood stem cell transplants is because many patients receive transplants from unrelated donors or family members who aren’t close genetic matches. Half of patients who receive these types of transplants develop an acute form of GVHD within 100 days of treatment. These patients are put on immunosuppressive steroid drugs with the hope that the patient’s body will eventually kill off the aggressive donor T cells. This was the case for Wartman after the first transplant from his brother, but the second transplant from an unrelated donor eventually caused him to develop the chronic form of GVHD. 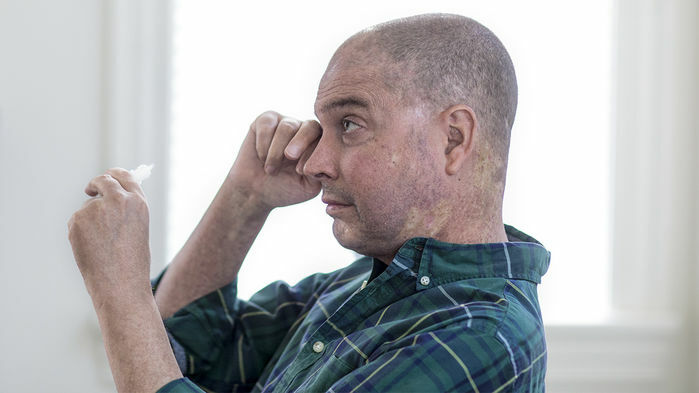 Wartman is now suffering from weakened muscles, dry eyes, mouth sores and skin issues as the transplanted immune cells slowly attack his body from within. Thankfully, his major organs are still untouched by GVHD, but Wartman knows it could be only a matter of time before his condition worsens. Wartman along with other GVHD patients are basically guinea pigs in a field where effective drugs are still being developed and tested. Many of these patients, including Wartman, have tried many unproven treatments or drugs for other disease conditions in desperate hope that something will work. It’s a situation that is heartbreaking not only for the patient but also for their families and doctors. There is hope for GVHD patients however. Science Magazine mentioned two promising drugs for GVHD, ibrutinib and ruxolitinib. Both received breakthrough therapy designation from the US Food and Drug Administration and could be the first approved treatments for GVHD. Another promising therapy is called Prochymal. It’s a stem cell therapy developed by former CIRM President and CEO, Dr. Randy Mills, at Osiris Therapeutics. Prochymal is already approved to treat the acute form of GVHD in Canada, and is currently being tested in phase 3 trials in the US in young children and adults. While CIRM isn’t currently funding clinical trials for GVHD, we are funding a trial out of Stanford University led by Dr. Judy Shizuru that aims to improve the outcome of bone marrow stem cell transplants in patients. Shizuru says that these transplants are “the most powerful form of cell therapy out there, for cancers or deficiencies in blood formation” but they come with their own set of potentially deadly side effects such as GVHD. Shizuru is testing an antibody drug that blocks a signaling protein called CD117, which sits on the surface of blood stem cells and acts as an elimination signal. By turning off this protein, her team improved the engraftment of bone marrow stem cells in mice that had leukemia and removed their need for chemotherapy treatment. The therapy is in a Phase 1 trial for patients with an immune disease called severe combined immunodeficiency (SCID) who receive bone marrow transplants, but Shizuru said that her hope is the drug could also treat patients with certain cancers or blood diseases. 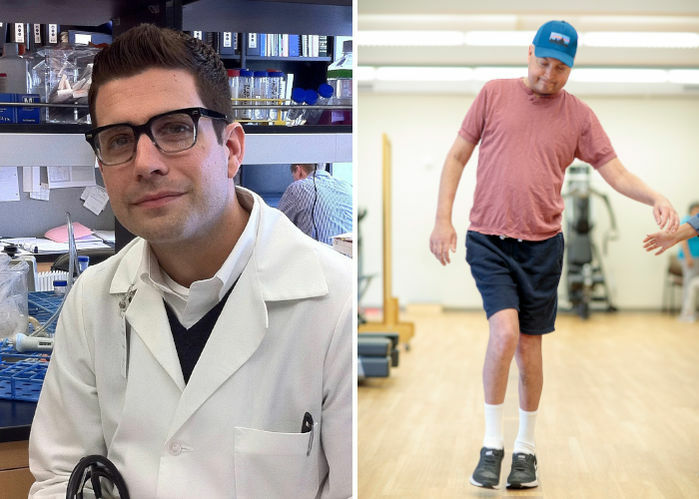 Patients like Wartman are an inspiration not only to other people with GVHD, but also to funding agencies and scientists working to advance GVHD research towards a cure. We don’t want these patients to suffer quietly. Wartman’s story is an important reminder that there’s a lot more work to do to make bone marrow transplants safer – so that they save lives without later putting those lives at risk.